Untertitel Are R&D and Training Complementary? 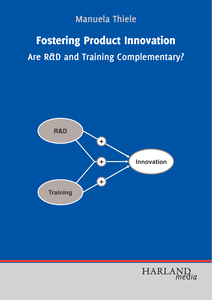 It is often assumed that synergies between R&D and training exist, which help to increase a firm’s innovation rate. However, a theoretical explanation and empirical proof of such synergy effects were still missing. Earlier research has dealt with the questions of why firms differ in their innovative behavior and what can increase the rate of innovation of companies. R&D as well as training both have been separately discussed as determinants of product innovation, albeit not in a joint setting, as analyzed in the present study. The present monograph uses complementarity theory as a theoretical framework and tests it empirically. By using a data set of over 5.000 German firms, this study investigates the complex interplay of R&D and training in fostering innovation. For one, the author shows that R&D and training indeed have a positive effect on product innovation. However, she rejects the hypothesis that both activities are complementary. The book is aimed at both practitioners and researchers with an interest in the area of innovation management.